Android App Player on BlackBerry Q & A - Answers to the *Tough* Questions! One of my favorite experiences at BlackBerry DevCon 2011 was the press briefing I attended on the topic of BlackBerry Runtime for Android Apps. Present from Research In Motion were Chris Smith, VP of the BlackBerry Development Platform, and Larry McDonough, Manager of Handheld Software Platform (focus on APIs and runtimes). In addition to fielding questions, the goal of the session was to educate the press with demos of Android apps running on the PlayBook and to witness just how easy the re-packaging/porting process is. Normally a session like this is half demo, half Q&A, but with a lot of bloggers and media in attendance for this one the questions started flying within minutes and didn't slow down right up until the end. I actually recorded the audio from the session (on my Bold 9900 of course) have embedded it above for playback or you can download it here. You may have to crank up the audio to hear everything, but if you're interested in learning more about RIM's ambitions in supporting Android apps on the BBX platform, I suggest you listen. There's a lot of great stuff in here. Note - I was pretty fired up in this Q&A so ask a LOT of questions (seriously... I was the annoying kid in class who had his hand up the whole time). For those who don't have time to listen to the audio, below I've condensed and written up in my own words the answers to what I felt have been some of the biggest lingering questions on the topic of Android Apps on BlackBerry. Keep reading for more! Q: What versions of Android will BBX Support? A: Research In Motion plans to support any open-sourced versions of Android. Currently version 2.3 is the newest version of Android that Google has released open source code for, so that's what the PlayBook OS / BBX currently support. When Google releases open source code for Ice Cream Sandwich, BBX will support that. Q: Why can't users just install APK files onto BlackBerry? A: RIM has their own security protocols, etc. on the QNX platform so they require apps to be in the .bar format. Q: What kind of apps are best suited to the Android app player? A: RIM has found that ~70% of Android apps port over with little or no issue. Apps that suit the Android App Player best are apps that are self-contained (think games) or apps that pull in data from the web (apps for websites, etc.). We've been finding the compatibility % to be more along the lines of 50%. See this article for a BlackBerry developer's perspective. Q: How important are Android apps to BlackBerry on the BBX platform? What % of apps in App World will be re-packaged Android Apps? A: RIM wouldn't give a definite percentage here, but do think re-packaged apps will make up a significant contribution to the App World catalog. RIM also made it clear that Android apps on BlackBerry are more of a bonus to the ecosystem. RIM made it clear that the two main pillars of the BBX platform as presented during the DevCon keynote are HTML 5 (WebWorks SDK) and C++ (Native SDK). That being said, RIM wants to make it as easy as possible for apps to make it onto the platform, which is what the AIR SDK allows for as does the Android runtime. The most integrated apps (super apps) and high performing apps (games) will ideally be built on one of the primary platforms, but for developers looking to expose their apps to more ecosystems and get their foot in the door of BlackBerry, supporting android apps and flash apps makes good sense. Q: What Android APIs are not supported? A: A whole bunch of Android hardware and software features are not supported through the APIs. RIM is working on reducing this list to make more of the APIs available, but also stated they will choose to not support certain ones for "business reasons." They wouldn't get into details here, so time will tell. For a full list of what's not supported, view this page on the BlackBerry website. Q: Do I need the source code for an Android app to port it over to BlackBerry? A: No, you just need the .apk file. Q: So does that mean App World will run rampant with Android apps that were not intended to be in there? A: No. The submission process is still the same here. You need to sign up as a developer with App World. If you submit apps, you need to have the rights to those apps for them to get published. Q: Will RIM do anything to stop individual PlayBook owners from sideloading Android apps onto their PlayBook that they don't have the rights to? A: Crickets chirping. See our BlackBerry PlayBook Apps forum for lots of already-ported Android apps. Q: To the consumer who owns a BBX device, will they know they are downloading Android apps from App World? A: Not until they open the installed app (and even then they may not notice). Technically once ported to a .bar file and submitted to App World, these are BlackBerry apps and the developer is now a BlackBerry developer. Consumers browsing App World will not know if they are downloading an app that was ported over from Android. This is the same notion in that consumers don't know if they're downloading apps today that were built Native or in Flash. Once installed on the PlayBook, the application shortcut style/treatment is exactly the same as any other app. However, once they open an app that was ported from Android, they will realize they are in an app that was originally developed for Android. 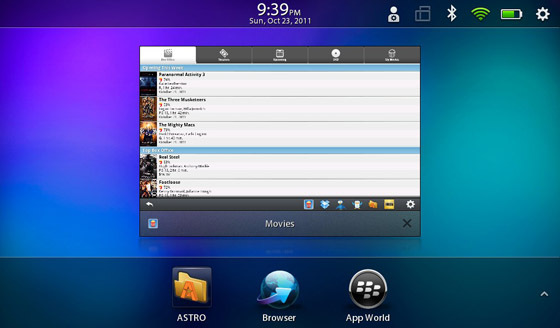 Under the current implementation on the PlayBook OS 2.0, the app opens in the Android App Player. Also, app design intended for Android kind of stick out (settings screens designed to match Android UI, etc.). Q: Will RIM push the fact that they are supporting Android Apps on BlackBerry? A: The answer isn't 100% clear here from RIM, but impression is that the Android Apps on BlackBerry message is currently targeted towards Android developers, tech media, Wall Street and current PlayBook owners as an answer to the question of how is RIM going to get more apps on the platform. RIM's take is that an app on the platform is an app - consumers don't care what SDK it was built on. So it's very likely you won't see much consumer-facing marketing on Android app support when BBX phones PlayBook OS 2.0 arrive. Right now it's a message that has to be out there to get Android developers taking advantage of it, and to keep everybody in the loop, but once the apps are there and devices are on sale, it'll probably be a pretty quiet marketing message on Android app support. Note - one of the reasons I think they won't want to make the message strong to consumers is that'll create confusion that all apps in the Android marketplace will be available on BBX devices - which will not be the case. Q: Will the Android App Player experience look the same on the consumer release of PlayBook OS 2.0/BBX phones as it does right now on the developer beta of OS 2.0? A: Not sure, but hopefully it will be changed from the current implementation. Right now the Android App Player opens as one app on the PlayBook. If you open additional Android apps, they load within the App Player (and you can toggle between them within the App Player) instead of opening multiple app instances as do other apps on the PlayBook OS. Personally I think this is a big issue as it breaks the user interface consistency on the PlayBook - so I think it's smart that they not release it as it is to consumers. They need Android apps to feel as native PlayBook as possible, which to me means running multiple app instances of Android apps at the same time, and being able to toggle between them with the standard gestures. It appeared to me that RIM is aware of this and working towards that goal. Other features are being implemented to help with this native feeling - for example, if Android apps require the keyboard, they popup the PlayBook's keyboard, not the Android keyboard. We're told a lot of "magic" is happening at the QNX level to interface Android into QNX for hardware and software calls. Q: Has RIM been talking to Google about this Android App Player implementation on BlackBerry? A: ........ No real answer, but definitely don't have the impression that this initiative has Google's permission or blessing, not that RIM needs it with open sourced versions of Android. Q: Has RIM thought about ingesting Android apps from third party Android app marketplaces? So instead of bringing over apps from single developers, do a deal with a third party app store (that already has the relationships with lots of individual developers) to port over as much of their catalogs of apps as possible? A: Definitely something that RIM has considered. Wouldn't confirm if they're doing it or not. This approach could immediately bring over a ton of apps to the platform, but could be a nightmare (developers waking up getting support emails for their apps in App World, even though they didn't put them there as it was one of their distributors that did). Q: How have Android developers been responding to this initiative? How do you convert them from just porting over Android apps to developing for BlackBerry? A: (From Larry talking about when he's doing presentations on this in the valley). At first the Android devs are sitting there with their arms folded, not looking that interested. By the time he shows them the tools and how easy it is, they're much more receptive and eager to test out all their apps. He's been finding a lot of Android developers know very little about the BlackBerry platform, so this is a great way to expose them to it and to making money and downloads from BlackBerry users (Android market isn't that great for making $$ for devs). As Android devs start to make money on App World, there should be a natural conversion for them to want to improve their apps (go native). And RIM will actively be working with developers to gear devs up to make the best apps possible. Q: If a developer decides to re-make their Android app with another BlackBerry SDK, will they keep all their ratings, etc. in App World? A: Yes, assuming the developer wants to. The app id, title, comments, ratings, etc. will carry through - the developer is just replacing the .bar file with an updated .bar file. App World doesn't know it's been replaced via a differently developed app. There's still some work to be done with the implementation of the Android App Player on BBX, but for apps that do port over successfully the user experience should be pretty solid. For consumers, it means more apps in App World (and a fun time sideloading all the ones that are not in App World but you can find the .apk for). The existence of the Android App Player also makes for a great introduction for Android developers to get a taste of BlackBerry and even start making some money off the platform. It's widely known that most Android developers don't make a lot of money off of Android Marketplace. If/when they see some money rolling in from BlackBerry users it could get a lot of them more seriously looking at BlackBerry and the BBX platform. And for developers now contemplating whether to built or to port, they should definitely check out this article on it looking at the App Player from a developer perspective.